FAE Cory D. Iverson was honored earlier this month at the 37th annual National Fallen Firefighters Memorial Weekend in Emmitsburg, Maryland. Thousands were in attendance along with CAL FIRE Local 2881 Honor Guard to pay tribute to the 103 names added this year. To view video of the Candlelight Service or the Memorial Service click here. To view photos from the memorial click here. Do you have questions or concerns? Firefighters First Credit Union can help. Call 800-231-1626 or visit their website for more information and how to apply. ARE YOU TRAINING OR JUST WORKING OUT? FIREHOUSE - Matt Page discusses the differences between training and working out and why we need to do both to be effective firefighters. When training on drags and carries, are we really training or are we simply dragging a dummy with a drag rescue device around to help improve endurance? In the fire service, we preach about the importance of training, and how it can greatly improve our effectiveness during an emergency incident. We also emphasize the need to be physically fit to perform the duties and tasks that may be required of us when the tones drop. The question is, although we demand both, are they both being accomplished? Training on forcible entry and ladder placement is great, but if our firefighters cannot physically carry a ladder or force a door, then our abilities are only book-knowledge deep. The same can be said if our members have biceps of steel, can lift ungodly amounts of weight, and run for miles without getting tired, but are unable to accurately read flow paths or perform a simple search pattern. We need to combine both very important activities to accomplish the ultimate goal of providing the best level of service to the communities that we serve. The strongest, most powerful tool in our arsenal is our brain. We must prepare not only physically, but also mentally for the challenges we face. Read full recipe and directions here! A Senate Bill introduced in January of this year took an important step through the legislative process Tuesday. The Wildfire Management Technology Advancement Act, Senate Bill 2290, was approved unanimously by the Senate Energy and Natural Resources Committee. It still has to be acted upon in the House of Representatives and the full Senate but this unanimous vote in committee is a good sign. It was introduced by Senator Maria Cantwell (D-WA) and co-sponsored by Cory Gardner (R-CO). If the bill passes and is actually implemented by the federal land management agencies it would generate progress toward what we have called the Holy Grail of Wildland Firefighter Safety, knowing the real time location of a fire and the resources assigned. Too many firefighters have been killed when one or both of these critical pieces of situational awareness were unknown. Recent examples with a total of 24 line of duty deaths were on the Yarnell Hill and Experanza Fires. The technology to monitor in real time a fire and firefighting resources has existed for years. Various systems are being used already by a few state and local agencies. The military does it for their war fighters, monitoring the enemy and their own forces. If implemented on fires, it will save lives. Firefighters lives are as important as soldiers. DOWNTOWN - Mrs. O'Leary was milking her cow when it kicked over a lantern, starting a fire that would overtake all of Chicago, 147 years ago. The fire killed an estimated 300 people, left thousands homeless and destroyed 3.3 square miles of the city. Of course there's a bit more to the Great Chicago Fire than a clumsy cow, and Mrs. O'Leary isn't to blame at all. put out a tw o-alarm fire at a tire business on Main Street early Wednesday a nd narrowly averted a disaster while doing so, a fire official said. A train on the a BNSF track roared by just as crews moved themselves and equipment offthe track as they battled the fire in the 3900 block of Main Street, Battalion Chief Ross Macumber, a spokesman for the East Contra Costa County Fire Protection District said. 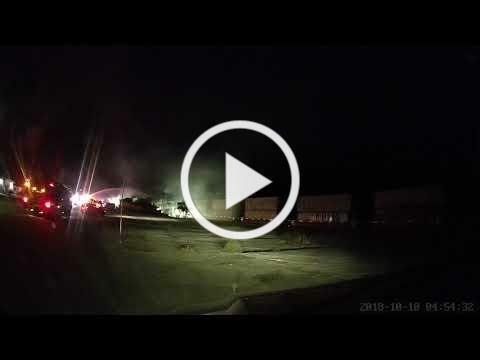 Firefighters responded to the blaze around 2:15 a.m.
"We do not know what happened with respect to the train, but it was a near-miss," Macumber said. "Anytime any agency in this county is working a fire near tracks, we automatically call the track dispatchers and request that those tracks be shut down. About 2-3 hours into this incident, all of a sudden a train comes by, and it came at a high rate of speed." Is everyone at your station signed up to receive the Fire Front and other important messages through Constant Contact??? If not, have them sign up using the link at the bottom of this newsletter or on the front page of our website! Below is a list of both Active and Retired members as of October 1st that have bad addresses. If your name is on the list or you have recently moved, please contact Danielle at (916) 277-9885 or dkelsch@L2881.org to update your address.